What's Next: Rethinking the Tech Conference: The tech industry has reached a maximum saturation point for conferences, summits and forums. But even at their best, these events fail to generate truly significant news because executives have been media-trained to the point of impenetrability. • Recode's Code Conference, which just wrapped up here in Palos Verdes, is the gold standard of US tech conferences. The speakers are A-list, the setting is intimate and the questions from Kara Swisher, Peter Kafka et al. are smart, direct and unforgiving. 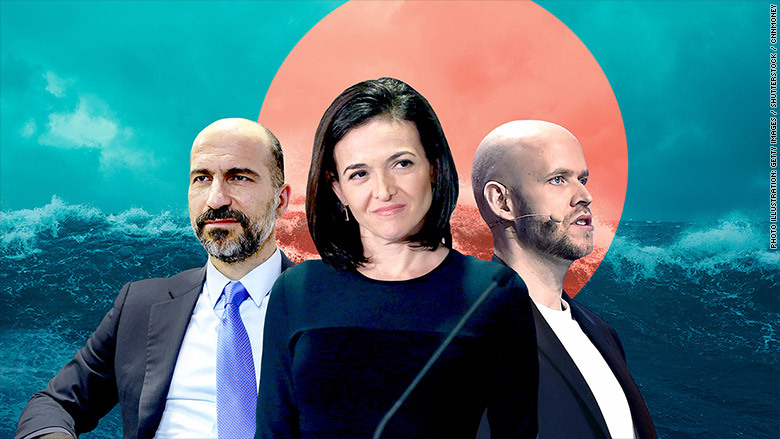 • Nevertheless, speakers like Facebook COO Sheryl Sandberg, Uber CEO Dara Khosrowshahi and Spotify CEO Daniel Ek have mastered the art -- there should be a German word for it -- of speaking for 30+ minutes without saying much of consequence or going beyond their comfort zone. • The conference had good moments: Snap's Evan Spiegel hitting Facebook, Mary Meeker's internet trends report, Airbnb promising to hire female board members. But in two days, nothing was said on stage that fundamentally changed the existing narrative for any of these companies. The biggest market-moving news to happen here -- Uber's plan to IPO in late 2019 -- was first shared on television with CNBC. The Big Picture: Business executives are more strategic and more cautious than ever in how they speak publicly. The business media needs to be equally strategic in pushing them to say more. Where There's Still Value: Offstage. Intimate conferences like Code remain invaluable for the networking that happens on the periphery, at private dinners and at Sky Dayton, Jason Calacanis and Brooke Hammerling's late-night poker games. What's Next: The conference circuit moves to Europe, with Daniel Ek's Brilliant Minds in Stockholm (June 7-8) followed by Cannes Lions on the French Riviera (June 18-22). Welcome to PACIFIC. We're headed home. The Economist has just released its new cover story on the risks posed by surveillance technology, which was the focus of yesterday's PACIFIC. The Big Picture: "Privacy rules designed for the landline phone, postbox and filing cabinet urgently need to be strengthened for the age of the smartphone, e-mail and cloud computing." • Just 51% of 13 to 17-year-olds say they use Facebook. • That is a decrease of 20% from 2015. Where are the teens going? The Big Picture: Facebook's long term problem isn't the trust crisis -- most people seem to have come to terms with giving up their privacy -- it's the cool crisis. Teens have moved on. The good news for Facebook is that they bought Instagram. The Bigger Picture: Social media platforms will always be vulnerable to generational shifts, because young audiences crave something new -- and something their parents and grandparents aren't using. Bonus: Facebook's Sheryl Sandberg has just told shareholders that the company will apply a "diverse slate approach" to its board, meaning it will look at underrepresented minority candidates when adding members. President Trump's State Department says it is planning to shorten the length of some visas issued to Chinese citizens, a move that could have major repercussions for tech and innovation in the United States. • "Chinese graduate students will be limited to one-year visas if they are studying in fields like robotics, aviation and high-tech manufacturing [that China has identified] as priorities in its 'Made in China' 2025 manufacturing plan." • "Chinese citizens seeking visas will need special clearance from multiple US agencies if they work as researchers or managers for companies on a US Commerce Department list of entities requiring higher scrutiny." • "The changes begin June 11." • "If the administration really wants to improve America's technological edge over China, the last thing it should be doing is driving away China's brightest minds." • "Foreign graduates have contributed greatly to the pipeline of innovation that fuels U.S. competitiveness. ... Chinese students have been shown to be among the most productive of all." • "Chinese students, suddenly confronted with a policy that applies only to them, might also reasonably conclude that the U.S. wouldn't be a safe or friendly environment." The Big Picture: The US has to navigate tricky waters, at once trying to prevent China from stealing US intellectual property while also encouraging China's best and brightest to participate in and contribute to America's innovation economy. Bonus: At Code, Alibaba's Joe Tsai hit Sen. Mark Warner for trying to hold China back. Uber CEO Dara Khosrowshahi says his company will be ready to IPO in late 2019. Hitting that target date will require restoring and maintaining user and driver trust -- a battle Khosrowshahi is currently waging in television spots -- and fending off competitors like Didi Chuxing abroad and Lyft at home. • "We're in a good position in terms of the company's profile, in terms of profitability and margins continue to get better" ... Uber has a "very strong balance sheet." • "Lots of things can happen in the world but we have a reasonable buffer as well, so I think we're in a pretty good spot." • "We're having discussions with Waymo," Alphabet's autonomous vehicle company. "If something happens, great. ... To the extent that that technology could show up on the [Uber] network, I think [it] could be a good thing." • "We believe we're in position to win in every market we're in ... India, Africa, every market we're in ..."
• "Some tech investors started searching their e-mail archives after a story on The Cut went viral earlier this week." • "Before she was arrested and imprisoned on Rikers Island, she allegedly tried to ensnare tech investors to fund the AI startup she claimed to be building." • "One NYC venture capitalist who asked to remain anonymous told me Delvey sent him an email in which she claimed to be working 'with professors from the largest AI research institute in the world' to develop 'soft- and hardware that will be assigned to selected high-profile contemporary artists.'" Entrepreneur Anil Dash, who has said he was also pitched by Delvey, tweets: 'If Anna had just waited a few months, she could have used 'blockchain' instead of 'AI' and now she'd be a billionaire." What Next: Warriors vs. Cavs, Part IV, Game 1. Is this "the biggest mismatch in modern Finals history?" Vegas gives Golden State a roughly 89% chance to win; FiveThirtyEight gives them an 80% chance. What we said on May 14: Warriors over Rockets in 7. ... What we said on May 15: Kevin Durant will get another ring. Television coverage kicks off at 6 p.m. on ABC.